Kinesiotaping for your feet and ankles. Aside from the historic victory that Kerri Walsh and her partner Misty May-Treanor had at the olympics last year, we all probably remember the colorful tape that Kerri had over her shoulder also. That colorful tape is called kinesiotape, and while it's been around longer than a couple of years, it is growing in popularity for treatment of many different conditions. We will discuss what kinesiotape is and why it has potential benefits in various foot conditions. Kinesio taping was originally described about 25 years ago by Dr. Kenso Kase of Japan. Dr. Kase felt that standard athletic tape, while it provided support to muscles and joints, was reducing range of motion and not supporting fascia of the body. He believed that in some cases, traditional athletic taping limited healing of conditions in the muscles and joints. When developing kinesio taping, Dr. Kase had the following in mind; create a taping technique that adequately supported bones and joints without limiting range of motion and also adding a component of lymphatic system benefit. 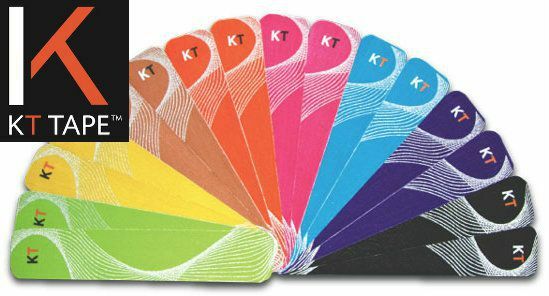 There are a few things that make kinesio tape different from traditional athletic tape. Kinesio tape is an elastic, adhesive tape. It is a latex free tape that (depending on the manufacturer) can be made of 100% cotton or 100% synthetic microfibers. It can be worn for 1-7 days, depending on the type, and some are better for aquatic sports than others. Kinesiotaping techniques are available for a wide variety of musculoskeletal conditions. Specific to the foot, this taping technique can be applied to provide relief of bunions, ball of the foot pain, achilles tendonitis, plantar fasciitis, ankle instability, posterior shin splints and tendonitis on the outside of the ankle. There are a lot of online resources to help you learn to KT tape on your own, though often times it is easier to have someone help you learn the correct way to apply this taping at least the first time or two. Kinesiotaping will be an option for treatment at Prairie Path Foot & Ankle Clinic very soon, so call and make an appointment if you have a condition that you need assessed or if you are interested in being taped or taught on how to KT tape!